Gilt yields are 17 basis points higher at 2.29%. The 15-year gilt yields reached the lowest ever point of 2.06% on 5 June 2012 before recovering a few days later as Spanish and Italian bonds experienced a significant increase in yields. The main concern was the banking system in Spain nearing collapse and the agreed 100 billion euro bailout without the austerity measures attached to the country. Borrowing costs for both Spain and Italy increased significantly with the Spanish 10-year bond yields increasing to 6.8%, close to 7% which is considered unsustainable and Italy 10-year bond yields to 6.2%. On the 29 June a radical bailout package was announced between Angela Merkel, the German chancellor, Mariano Rajoy, the Spanish prime minister and Italian prime minister Mario Monti which will involve a supervisory system for eurozone banks to provide funding directly from the European bailout fund and without the country requiring to implement austerity measures. The immediate effect was a reduction in the yields for Spanish 10-year bonds to 5.8% and Italy to 4.5%. Although annuity rates have reduced throughout June there may be scope for annuities to increase with the news of the European bank bailout fund if gilt yields. 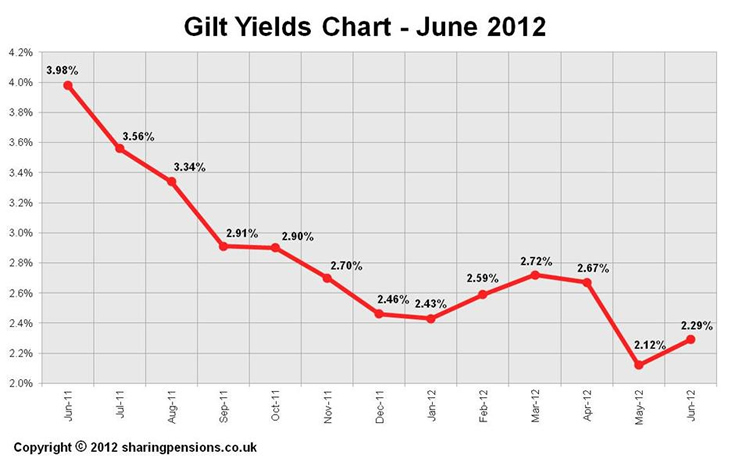 As a rough guide a 17 basis point increase in gilt yields would translate into a 1.7% increase in annuity rates. See Annuity Rates 2012 for the latest updates.